Duct tape being a firm and air tight adhesive is on getting fame in home crafting. New trendy and styled accessories will be on your finger tips if you get yourself involved in fertile duct tape crafting mania. The classy home trinkets and baubles can get a lot thriftier from wisely and informatively used duct tape rolls. 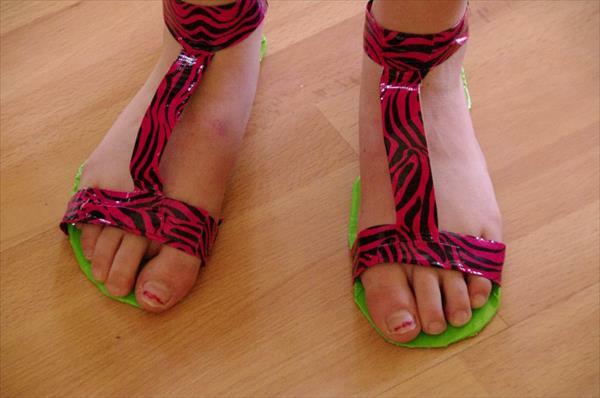 This time we have made a vibrant and fashionable enhancement in our DIY duct tape crafts gallery. We have homely produced a creative pattern of DIY duct tape hair bow which looks pretty cool and stylize the hair fashion. Take duct tape strips, the number of these strips will vary according to the size you want to have constructed with your creative finger tweaks. We have taken 3 trimmed rectangular strips to be overlapped finely to have a little big large rectangle. Now make some wise tiny folds and sandwich the gummy and sticky sides in between the folds. Now pinch the middle side and your bow pattern is almost done to be on your head. Now select a contrast for the selected bow color and make it fastened at the mid pinched position of the bow with an elastic band inside and roll the duct tape for targeted grip. Finish the work by removing the unwanted edges. Note: Don’t let your fingers touch while releasing the duct tape from rolls, it may teasing at some extent but a little bit care in work can save lot of time. 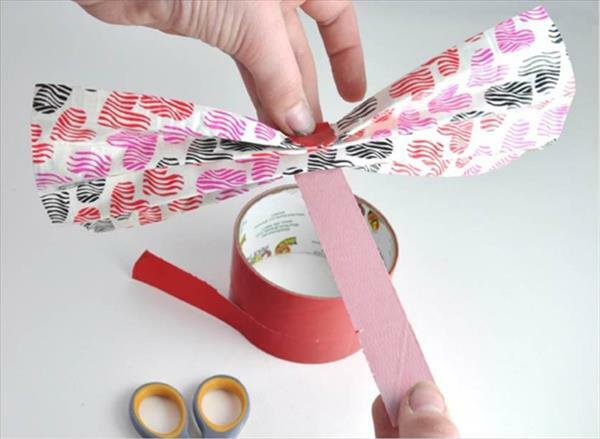 Use your finger tips to get desired lengths of tape from duct tape roll.